April may bring us showers (for those pretty May flowers) but it will also bring VOLUNTEER OPPORTUNITIES! Earth Day is on Monday, April 22 and we have some big plans in store. 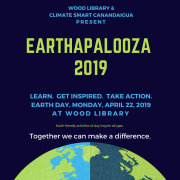 EARTHAPALOOZA 2019! We'll have indoor and outdoor activities for all ages and everyone is invited! All of our librarians are cooking up some plans to make sure all ages have guaranteed fun (and learning!). We'll need people to help setup rooms for speakers and activities, greeters to answer questions and offer direction for visitors, chaperones for activities, distribution of promotional materials and a few other jobs as well. This position is for a two hour "shift." 10-12:00, 12-2:00, 2-4:00, 4-6:00.